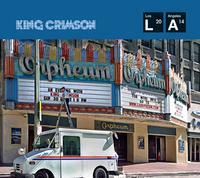 Released to coincide with the 46th anniversary of King Crimson's formation in January 1969, Live At The Orpheum comprises performances from the band's critically acclaimed, sold-out 2014 US tour. Forty-one minutes of live material from the new seven piece King Crimson line-up, including classics such as "Starless," "Sailor's Tale" and "The Letters"
King Crimson has performed, recorded & released material in its own inimitable manner for the past 46 years. As the band enters its 47th year of operation in 2015, the occasion is marked with the first release culled from the band's Autumn 2014 US tour. Comprised of 41 minutes of material by the newest incarnation of the band fronted by the line-up's formidable three drummer setup, Live At The Orpheum has been mixed from 24bit multi-track performances recorded at the band's two concerts at the Los Angeles venue. Featuring a mixture of new & old King Crimson material - some being performed live for the first time - the album makes an ideal recorded debut for the septet. For those who travelled from all over the world to see the US shows, it's an opportunity to relive the power, precision & sheer musicality of the concerts. For those who couldn't attend but wanted to, it's an opportunity to hear why the concerts generated such excitement. For any fan of the band, recent or long-term, it's an essential purchase. With further concerts being planned for 2015, Live At The Orpheum is the perfect start for a new year of King Crimson music. This release is available as CD+DVD-A digi-pack which offers stereo audio in 16/44.1 and 24/96 hi-res respectively.